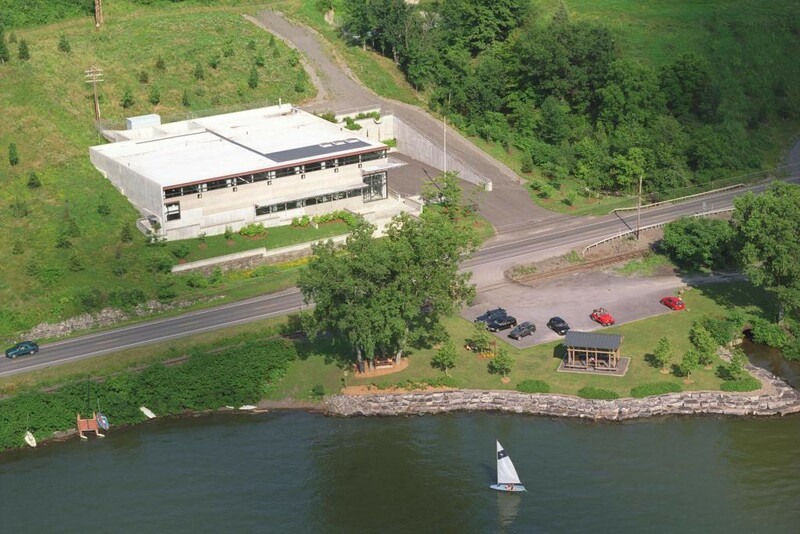 To anyone driving past, the gray stone building on Ithaca’s Lake Shore Drive looks like any modest modern industrial facility. The large blue pipes coming out of the floor and curving toward their passage through the back wall would seem to confirm that assumption. But this modest building represents a revolution in green technology, as Cornell’s Lake Source Cooling (LSC) facility is one of the most significant environmental initiatives ever undertaken by an American university. Since it became operational in July 2000, LSC has saved an average of 25 million kilowatt-hours of electricity per year versus previous cooling methods — enough to supply electricity continuously to 2,500 homes in Tompkins County. The electricity usage and costs to cool Cornell and Ithaca High School have been reduced by about 85 percent. The start of LSC served as the kickoff to the Energy Conservation Initiative at Cornell, focused on ways to reduce carbon dioxide emissions from energy use in a cost-effective manner. The Energy Conservation Initiative has offset the energy impacts of new buildings constructed on campus by retrofitting existing buildings with the latest energy-saving technology. Campus energy needs account for nearly two-thirds of Cornell’s inventoried carbon dioxide emissions. Since 2009, Cornell has reduced its carbon dioxide emissions by more than 30 percent through not only LSC and aggressive energy conservation, but through constructing a new combined heat and power plant, eliminating the use of coal and building solar farms. The LSC facility upgraded the central campus chilled water system to an environmentally sound design that conserves energy and uses a renewable resource: the deep, cold waters of Cayuga Lake. It was a transformation with a price tag of $58.5 million — a significantly higher cost than simply replacing the existing chillers with new ones. However, LSC provides the university with a method of cooling that eliminates refrigeration equipment and its associated energy use, drastically lowers the environmental impact from energy generated by power plants using fossil fuels, and avoids future problems with the new generation of refrigerants designed to replace chlorofluorocarbons (CFCs). Since its inception, LSC has won seven major state, national and international awards, including the 2002 New York State Department of Environmental Conservation Governor’s Award for Pollution Prevention. After several months of research and review the project was formally proposed in 1994 and approved by the New York State Department of Environmental Conservation (DEC) in 1998. Nearly four years of environmental study and review resulted in a four-volume, 1,500-page Environmental Impact Statement that detailed the potential impacts of the project on the lake. The DEC determined that LSC could provide the stated environmental benefits without harm to Cayuga Lake. Even so, Cornell agreed to include many special features in the construction and operation of the project to further minimize risk of an adverse impact, including nearly a decade of lake monitoring. 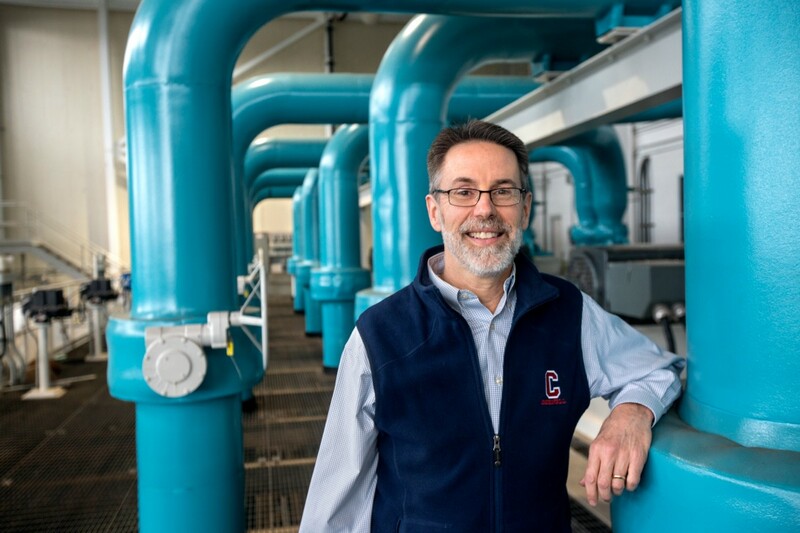 Lake Source Cooling cools Cornell and Ithaca High School buildings using the cold water from 250 feet below the surface of Cayuga Lake instead of traditional refrigeration-based water chillers. Non-contact cooling systems of various types have existed since the dawn of the Industrial Revolution. The technology employed by LSC transfers the heat from the water circulated to and from campus to the lake water through heat exchangers that keep the lake water and campus water separate — the two loops never mix. The laws of thermodynamics dictate that energy flows naturally in only one direction, from higher to lower energy states. Water falls down from a higher to a lower state, heat flows from inside warm buildings to the colder air outside, Joyce explains. The same thing is going on with LSC. When Cornell decided to pursue LSC there were few models of such a system in operation. 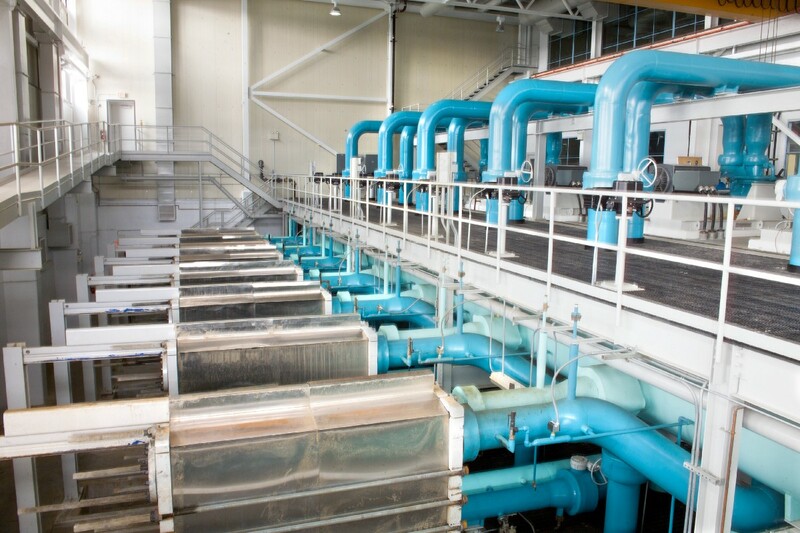 Halifax, Nova Scotia, built its first seawater cooling in 1986, and Stockholm, Sweden, built the world’s largest seawater cooling system in 1995. Since LSC began operating, lake cooling systems have become more common. Toronto cools its downtown commercial district by drawing water from Lake Ontario. In Amsterdam, two lake water systems cool two business districts with water drawn from two artificial lakes. In Switzerland, the GeniLac project uses water from Lake Leman, the largest European lake, to cool buildings in downtown Geneva. In Honolulu, a seawater cooling system is in the planning stages. No project of this size and complexity could be executed without collaboration on a scale equal to the task. This type of collaboration between faculty and facilities engineers was unprecedented at Cornell. College of Engineering faculty provided advice, economic analysis, risk analysis, deep lake water structural design, hydrodynamic (water and heatflow) analysis and water chemistry impact analysis. Faculty members also participated in the public discussions about impacts and helped provide rational, science-based, impartial information to assure the public that the project could happen without harm to Cayuga Lake. The LSC project is overseen by a faculty advisory committee that includes Todd Cowen, director of the DeFrees Hydraulics Laboratory and the Kathy Dwyer Marble and Curt Marble Faculty Director for Energy at the David R. Atkinson Center for a Sustainable Future; Cliff Kraft, associate professor of natural resources; and Hairston. Hairston, who is regarded as one of the world’s leading experts on how lakes function, has served on the faculty advisory committee since 1994 and helped write a report at the beginning of the project on the possible environmental impact LSC might have on the lake. Circulating water from deep in the lake could increase the risk of algal blooms because of the nutrients in the water, negatively impacting water quality and aquatic life. Detailed monitoring and calculations have tracked the nutrient transport and environmental impacts since the facility began operation in 2000. These data are the basis for the creation of a water quality model of Cayuga Lake. As one of several conditions the DEC placed on the LSC’s discharge permit renewal in 2013 Cornell agreed to spend about $3 million on the Cayuga Lake Modeling Project (CLMP), a computational water quality model of Cayuga Lake and its watershed developed in partnership with independent experts, to provide a better understanding of where phosphorus comes from and how it affects the lake’s ecosystem. The CLMP issued a new report in December 2016 that concluded that LSC is having no discernable impact on Cayuga Lake. The CLMP has benefited from active participation of the Cayuga Lake Monitoring Partnership, a group of local water quality professionals and other stakeholders originally formed to develop a plan for tracking water quality in the southern end of Cayuga Lake. Since the creation of that plan in 2008, the Monitoring Partnership has expanded its mission to become a forum where agencies and organizations monitoring the health of Cayuga Lake and its watershed meet regularly to share the results of their work and to explore ways to improve and expand monitoring efforts. In addition to members of the Tompkins County Water Resources Council, the Cayuga Lake Monitoring Partnership includes members of the LSC faculty advisory committee, Cayuga Lake Watershed Network, Community Science Institute, Finger Lakes Institute, the Floating Classroom, Ithaca Area Wastewater Treatment Plant and Cornell researchers. The Cayuga Lake Monitoring Partnership received a Town-Gown (TOGO) award in 2014. In addition to keeping state and local stakeholders informed, Cornell project team members prepared scientific papers for publication in peer-reviewed journals to keep the larger scientific community apprised of major findings and implications for lake management. The project benefited from and supported the work of faculty, postdoctoral research associates, and graduate students in various Cornell colleges and programs, in alignment with the university’s commitment to envisioning campus facilities as a “living laboratory. Hairston has discussed LSC in a course, Limnology: The ecology of lakes. He also had a three-year federal grant to study Cayuga Lake and the importance of Daphnia (sometimes referred to as a “water flea”) as consumers of phytoplankton on the south shelf. The grant enabled Hairston to hire an undergraduate student for each of the three years of that project, and each made a presentation on campus of the results at the end of the summer. One student presented to a conference at the Finger Lakes Institute and won a best student talk award. Cowen mentions LSC in several of the courses he teaches and has used data from the LSC monitoring program in other courses. The thesis of one doctoral candidate is based on analysis of the LSC monitoring program data. LSC support is currently being used by a research scientist who was a postdoc on the project for several years and is now finishing up development of a 3-D computer model for Cayuga Lake. Kraft teaches an introduction to environmental science course and always takes the class on a tour of the LSC facility. “This is an opportunity for students to see what a carbon-free future would be like,” says Kraft. In exchange for an easement to cross the property belonging to the Ithaca City School District, the university agreed to provide cooling for Ithaca High School for the life of the project, providing more than $1 million in long-term benefits in addition to reducing electric energy use for cooling by 90 percent. 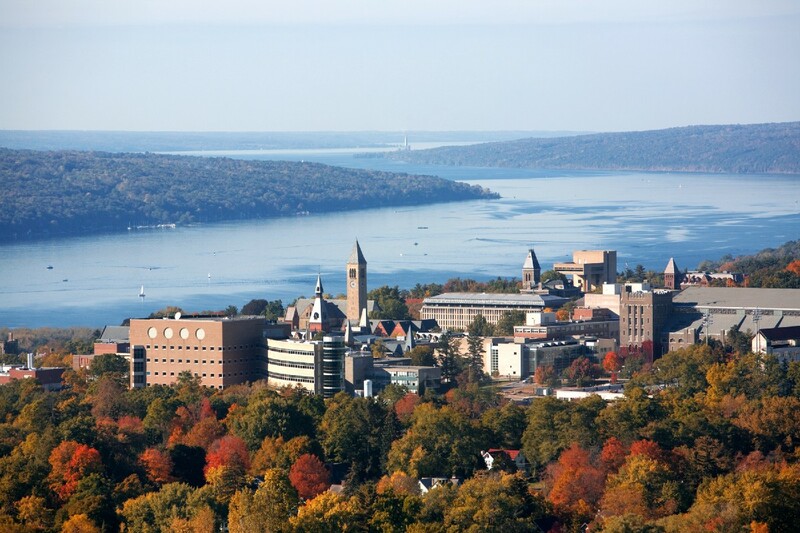 Cornell also provides a direct fiber-optic Ethernet link from the university to the school district to promote collaboration between faculty and the Ithaca schools. Each year, students from Cornell, Ithaca and the surrounding area tour the LSC facility and learn firsthand about its environmental benefits, technology innovation and how they can help create a sustainable future. The university also spent more than $1 million to install new water and sewer lines, storm drains, curbs and sidewalks along streets between Fall Creek and West Avenue, and for easements across private property. In addition, a small public park — the only town of Ithaca park on Cayuga Lake — was created across Lake Shore Drive from the LSC facility. These steps and more put a clear, tangible benefit to the local community “right in people’s hands,” Joyce says. Construction of LSC included several local contractors and trucking companies. Payroll associated with construction jobs during a two-year period exceeded $10 million, and local and regional purchasing surpassed that figure by several million dollars. All backfill materials, concrete and landscaping materials were purchased locally. 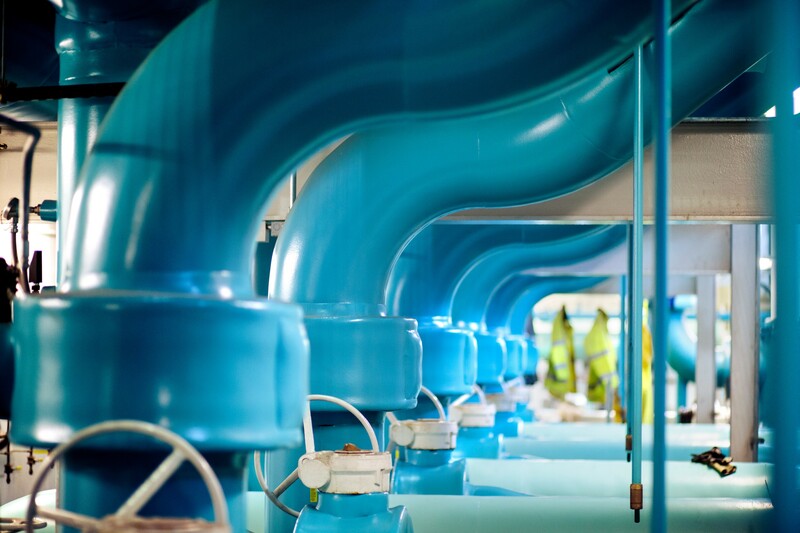 The LSC system is designed to last 75 to 100 years, more than twice the typical life of chillers, although Joyce believes the facility could last up to 150 years. The project is cost-effective in the long run because of its energy savings, long life and replacement of outdated chillers containing CFCs. Learning. Discovery. Engagement. Join the #Cornell conversation.